Internationally important wetlands are being polluted in the Waikato, as Al Fleming, Forest & Bird’s Central North Island Regional Manager, explains. New Zealand’s wetlands can be described as the “lungs” of land and water and support a greater diversity of native birds, fish, invertebrates and plants than most other habitats. But the Waikato River’s lungs, which are made up of a peat and shallow lake mosaic surrounded by peat domes, are riddled with cancer. Decades of “smoking”– land reclamation and the use of the wetlands as farm drainage ponds – have resulted in Waikato’s wetlands being classified as anywhere from eutrophic (polluted – high levels of nutrients and algae) to hypertrophic (really polluted – supersaturated in phosphorous and nitrogen). This extensive wetland system includes Whangape, Rotokauri and Waikare lakes and the internationally significant Whangamarino wetland. This wetland system is one of the most important freshwater habitats in New Zealand. Home to raupō/bulrush and harakeke/New Zealand flax, the Waikato wetlands provide habitat and food to native birds including the North Island fernbird, spotless crake and the Australasian bittern. Longfin and shortfin eel dwell alongside mudfish. Dabchick, greyduck and grey teal live on and near the water. Many of these species are in trouble from not only pollutants but also land- and water-based animal pests. Mustelids and rats predate them on the nest and koi carp muddy the waters and predate on their young (a voracious omnivore!). Plant pests such as willows monopolise fringing vegetation space while the weed parrot’s feather creeps along the water’s edge. The Waikato River wetlands are a focus for the Healthy Rivers project. Let’s hope we can give up “smoking” our wetlands and kick the habitat back into life. 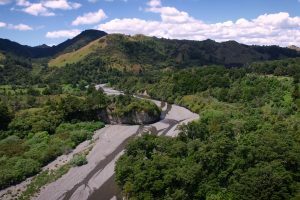 The Healthy Rivers planning process in the Waikato is just one freshwater initiative Forest & Bird is involved in around the country. The Society also manages wetland and swamp reserves, and advocates for the implementation of the National Policy Statement on Freshwater Management. Over 90 percent of New Zealand’s wetlands have been drained or filled. Wetlands perform vital ecosystem services such as improving water quality and reducing flood risks. They are also essential in managing climate change. Healthy peat bogs are year-round sinks of two to five tonnes of carbon per hectare – locking it up in their soil indefinitely.